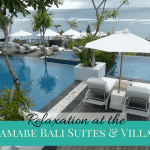 There was many things I wanted to do on our trip to Bali but there was one thing I HAD to do – stay in a villa around Ubud surrounded by rice terraces. 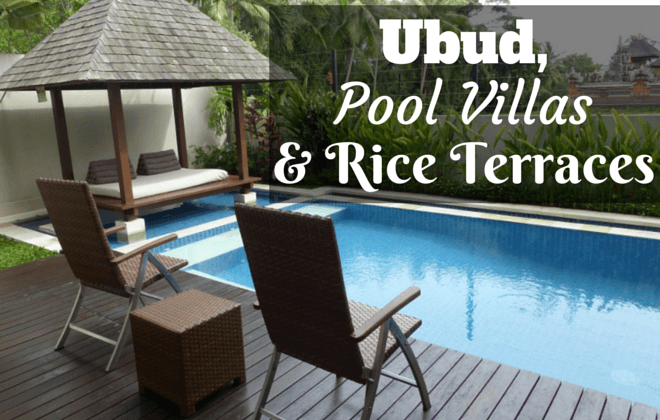 Over the last few years, I have come across many expats who are living around Ubud and all of them seemed to have one thing in common – gorgeous houses with pools, often surrounded by rice terraces. 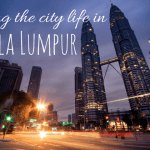 It has made this one of the top things I have wanted to do, so when we planned our bali trip, I was straight onto Airbnb and looking at the options. It didn’t take long to find the perfect one! I always worry when I look forward to something so much that I will end up disappointed. This was certainly not the case this time. Our villa was truly perfect and I had the experience I had been craving. We knew as soon as we stepped into the villa’s grounds that we were heaven – this was our first view! It took a few minutes to get the kids in the house as they loved looking at the fish in the pond under the walkway. I was more interested by the gorgeous gazebo in the background. The first thing we noticed inside was just how large this house was. We walked into a massive lounge room with an incredibly high ceiling and staircase to the upper level. In addition to the living area, there is a massive dining room, a big kitchen, a powder room and a beautiful water feature with fish. The dining table is the biggest and best I have seen. The kitchen is the most equipped I have ever seen. I dare you to find something missing! 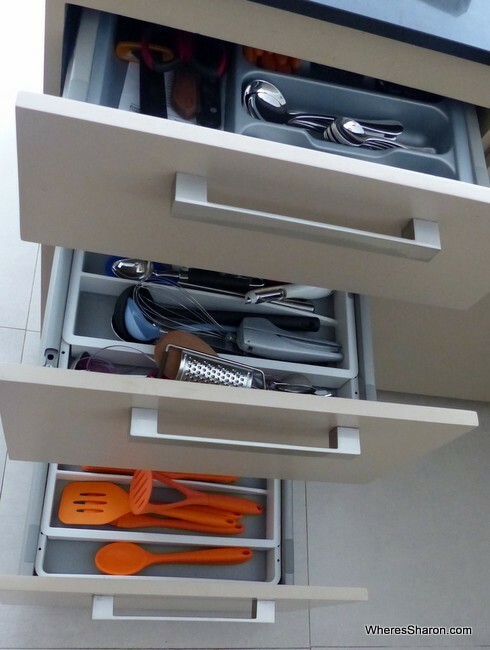 One set of kitchen drawers. Upstairs, there are three large bedrooms and a study area complete with shelves full of books and games. All bedrooms have their own big ensuites. 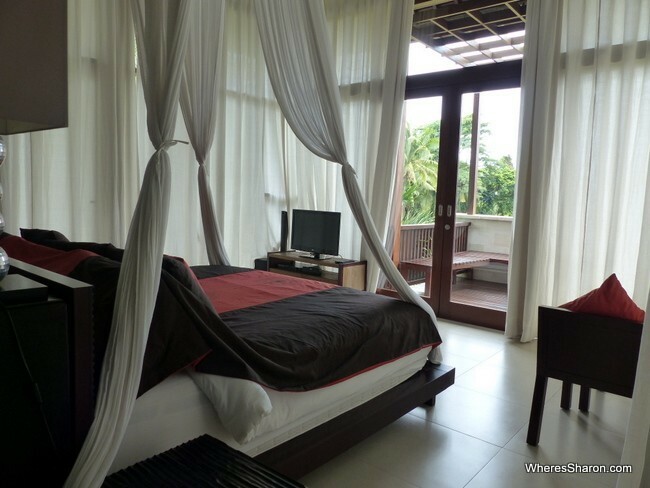 The main bedroom is particularly stunning – a big king size bed with a canopy and then a great balcony with day beds looking over the rice terraces. 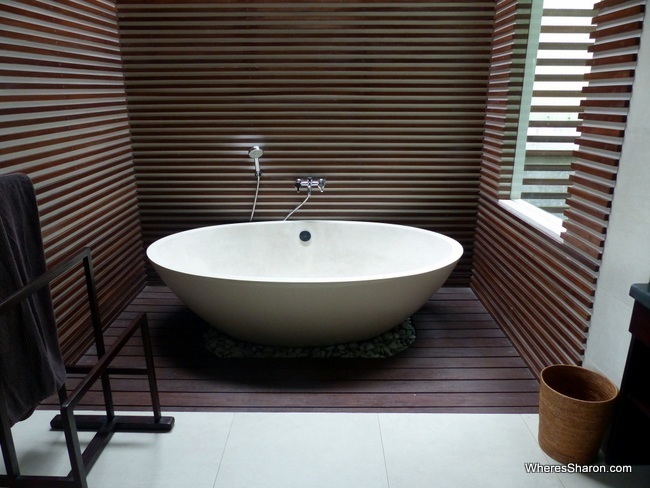 The ensuite has a massive shower and bathtub with a glass roof above the bath tub. There is also a walk in wardrobe. The other bedrooms also have balconies with greenery to give them all good outlooks. In any other house, these bedrooms would be considered main bedrooms. They are great as well. Surrounding the bottom level is my favourite part – the beautiful outdoor areas. Three sides of the house consists of beautiful gardens with a pool, gazebo and outdoor shower. There is also a fish pond with a walkway at the entry to the property (picture above). It is all gorgeous and well maintained. 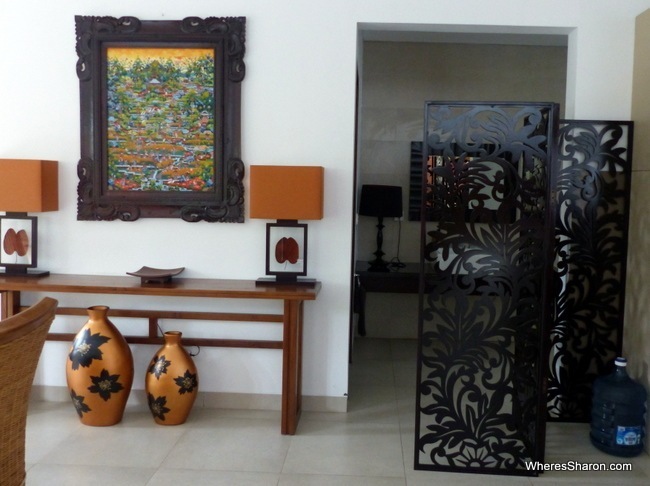 The whole house is just furnished beautifully with so many extra knick knacks that make it gorgeous and homely. The towels and linen are fantastic and the beds super comfy. The house is serviced daily and the helpful manager will also do your washing. He seemed to know what we would want at just the right time without us saying anything – like he magically appeared with floaties for the kids when they were trying to swim in the pool. It was fantastic. 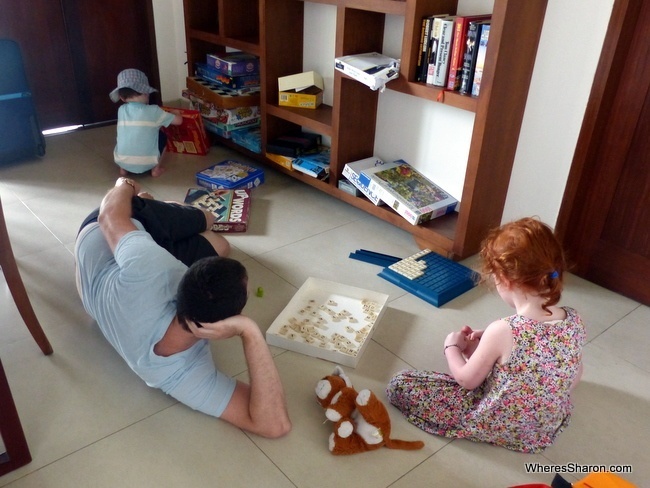 We quickly fell into a routine of morning swims, then going into town for lunch, followed by a nap for the kids while we worked, then another swim and relax in the gazebo with a drink or two, a delivery dinner, then watching movies and shows on one of the massive TVs. It was a fabulous week! My mum joined us for half of our time. This is a great place for a multi generational trip with so much space and all of us having our own bedroom suites. She is vegan (and I am vegetarian), and Ubud is a perfect place for us. There are lots of great eating options, unlike other places in Bali where I struggled to find much that interested me to eat as a vegetarian. The other great part about our time here is mum was here to watch the kids! So we actually had an afternoon and evening to just the two of us. It is such a perfect place for a date! Ubud has a crazy amount of day spas, and we spent half a day having treatments together and then a fabulous dinner. It was our Christmas present from mum and worth the wait. 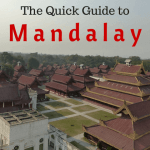 The biggest upside and downside of this villa is the same thing – there is not much around the villa apart from local villages, temples and rice fields. This was exactly what we wanted and it was incredibly beautiful and relaxing. I loved enjoying my beautiful surrounds with the sounds of roosters, ducks and the water features. However, it is also means that to get into Ubud, you need to take a taxi. Taxis here are private drivers and the villa manager can give you a number for one and also lend you a phone for local calls for the duration of your stay. We quickly became familiar with many. The price is 50,000 rupiah (AUD$5) each way so this can start to add up. It takes less than ten minutes. Alternatively, the manager can help arrange a car hire for you for a great price and there are two car spaces in the villa compound. There is also a bicycle and helmet in the villa. We also liked walking around the streets surrounding the villa, although the kids could find the dogs a bit scary. 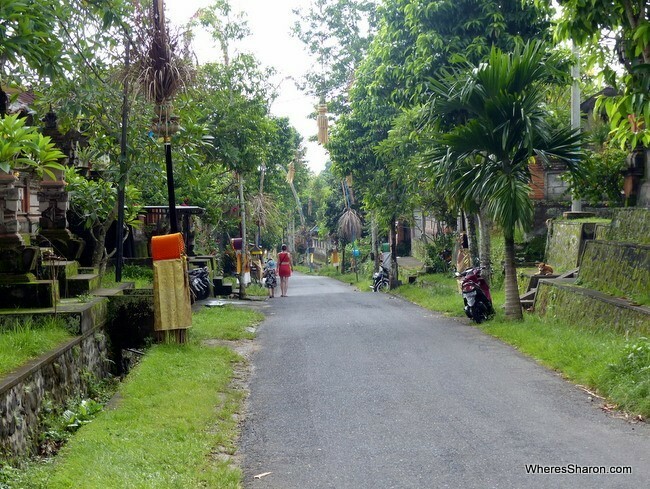 There are local shops very close, and many food places in Ubud will deliver. I think you can guess what the kids thought about this place – they loved it! The pool was a big hit and their swimming improved a fair bit while we were here. 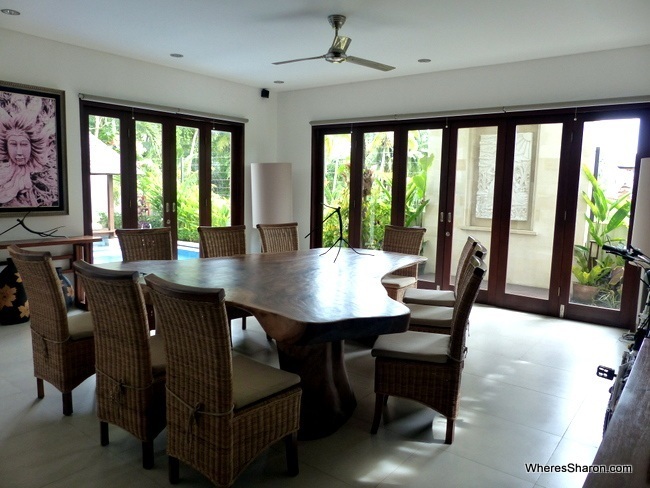 One reason why I booked this villa is that the house is completely enclosed and all doors have keys, so there is no way the kids can get out to the pool without us opening the door for them. Many places that I looked into had an open air living space and I would not feel safe with such young kids near that. It is possible to hire pool fences, although I don’t feel that is necessary at this place. The games were also a big hit and they loved their bedroom. They are always happier when they have their own space. They also felt very special having their own bathroom. This villa was fantastic. We had my mum stay with us for some of the time and there was more than enough room for all of us. The three big bedrooms with ensuites particularly make this house a great idea for an extended family holiday or a group of friends. 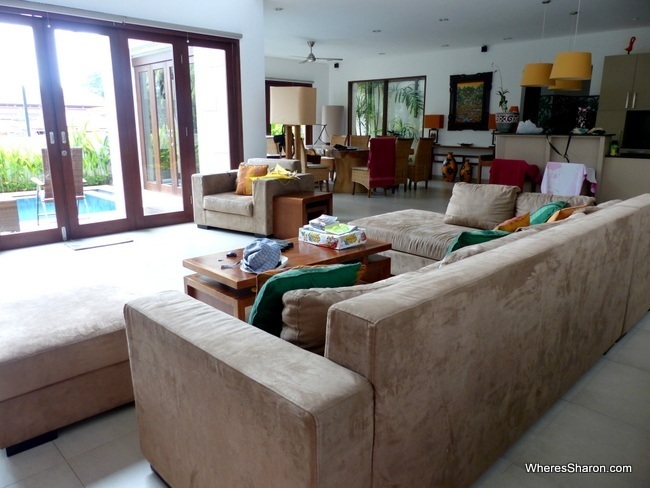 What was also great about this stay was the owner emailed us when we booked and again just before our stay with an amazing amount of information about the villa and Ubud in general, including recommendations of where to eat, visit, how to get around etc. It made me wonder why more places don’t email you this information beforehand instead of waiting until you arrive. It was very handy. The villa manager was also helpful and it was easy to arrange a pick up from anywhere via email. He also helped us throughout our stay with any query. I really have no complaints – the internet (my common complaint) was even good! The price is good too. It’s hard to believe that we had all this for what we would pay for a unit at a caravan park park at home in Australia. You can book this villa yourself here. First of all, though, join up to Airbnb here and we will both receive about US$25 credit. 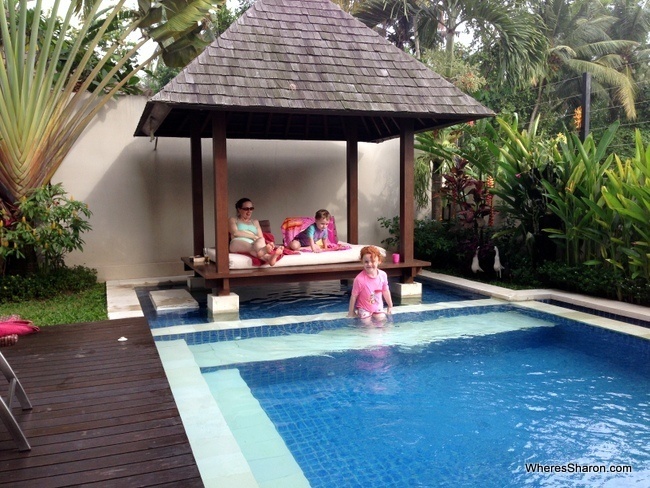 You can also read our complete guide to planning your Bali family holiday. Disclaimer: We were invited by Airbnb to review our choice of properties. Our host did not know this and, as usual, our view are our own. Ready to book your own Ubud adventure? Wow! I’m in love with this villa! 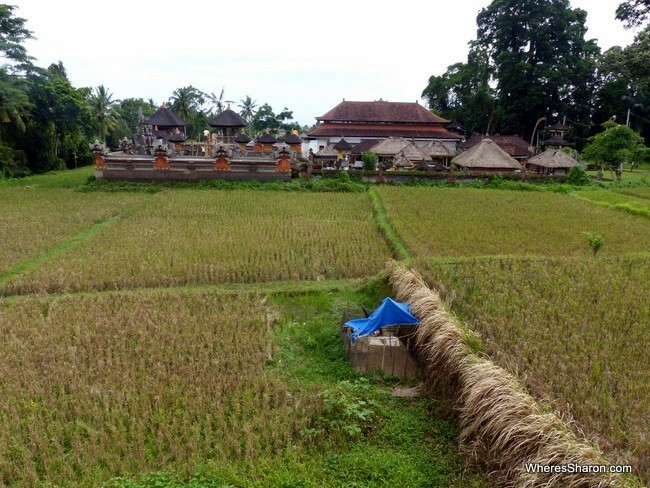 Makes you want to book a flight to Ubud a-sap! Nice post. The villa is amazing. I really like the pond decorated with a gazebo. Very nice. and a cool place to seek peace. I had never been to Ubud before, and I only know of the information on the internet. Maybe this is a good reference if one day I traveled to Bali. 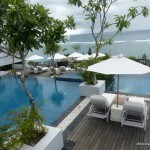 Tell me, if the villa is fun for those who want a honeymoon? it seems interesting. Thanks Sarah! 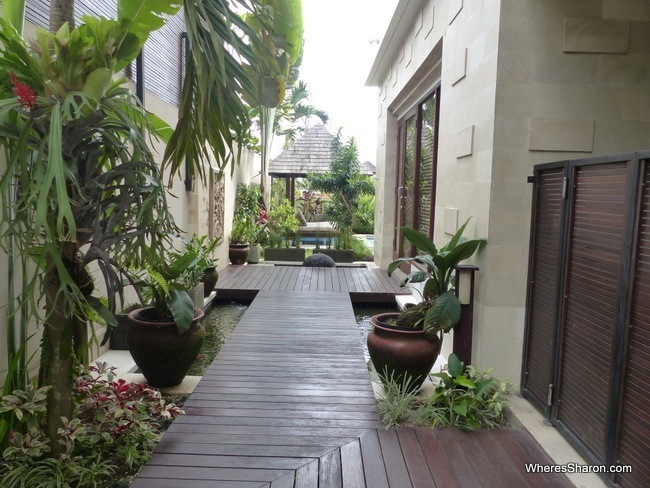 There is a link to the villa at the end – https://www.airbnb.com.au/rooms/3775442/?&af=1829010&c=APAC_AU_Blogger_WheresSharon_1 – It’s called Villa Pura Padi. If you haven’t signed up for Airbnb before, signing up here first will give you $45 credit. Enjoy! 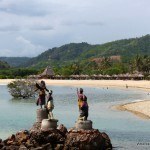 We plan a travel to Bali. Your site will be very helpfull.